We only go to a few hockey games each season, so today we trekked on the subway to Brooklyn to see the Islanders play the Winnipeg Jets. 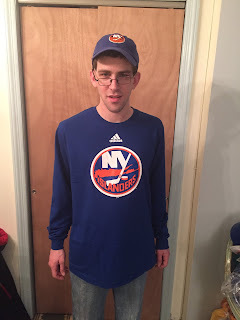 As you see above Lee got an Islanders' short and cap that he wore to the game. The highlight was the hat trick scored by rookie Matthew Barzal. It was the first hat trick by an Islander rookie since 2011.